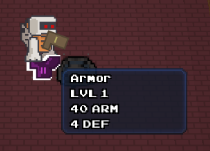 Now that I made a bunch gear logic changes and hopefully settled on how gear provides gameplay values, I need to show feedback to the player. 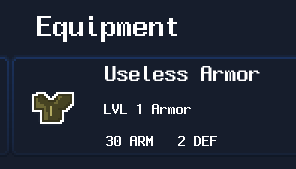 The reason is because I removed the bonuses and thus the “enable armor/shields” ones that would tell UI that there is indeed a value to use. So I now just check the max value. What does 48 and 32 mean? Who knows! Okay, okay, duration is 4.8 second and speed is approximately 3.2 tiles per second. But I don’t know if I want a decimal separator there and lengthy explanation of what they mean. It’ll do for now. I think this feels much better to the player. Even when gameplay difference is marginal between items, they do get told that there is a difference and color-coded to show a quick preview. Of course I can’t have the play open their info panel to compare items. I need this to happen in the game world with a quick comparison popup when the player is ready to pick up an item to replace what they are carrying. In fact, this is way more important than the big panel, so I don’t know why I’m not doing it first. I don’t really care if this has a nicer layout — it’s short and sweet and I don’t think I will bother with changing it unless there’s negative feedback. 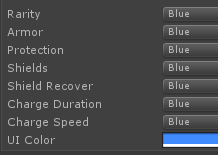 I wonder if I should have a visual difference between item types. There’s the name/label and the item shape itself already, so it might be enough. One note is that the box compares to the currently equipped weapon and not both of them. I think this is fine, as the player can swap the weapons very quickly and the box will switch to the other. And that about wraps up the major parts of gear values and their feedback. I think I have enough visual and gameplay feedback to justify the feature. In other words, I show it enough in-game so it feels like a full feature and not some back-end stuff I spent ages on and no one ever saw. It should feel nice to get an upgrade, even when it’s tiny.